Welcome to The Richway Biomat Store. Biomats are fast becoming known for their powerful healing effects. The Biomat is a 17 layer healing pad that emits far infrared rays and negative ions and has amethyst in the top layer. This store only sells the newest model of the Biomat, the Biomat 7000mx. This store is 100% secure so you can shop with confidence. We invite you to create an account with us if you like, or shop as a guest. Either way, your Biomat Store shopping cart will be active until you leave the store. 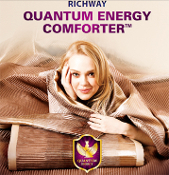 GET YOUR BRAND NEW RICHWAY BIOMAT 7000MX NOW!